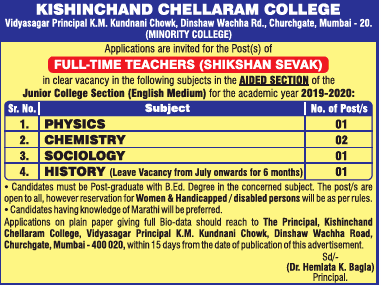 Kishinchand Chellaram College, Mumbai has advertised in THE TIMES OF INDIA newspaper for recruitment of Teaching Faculty- Teachers jobs vacancies. Interested and eligible job aspirants are requested to apply within 15 days from 20th March 2019. Check out further more details below. About School: Kishinchand Chellaram College is one of the premier institutions affiliated to the University of Mumbai and recognized by Government of Maharashtra. It was established in 1954 by the Hyderabad (Sind) National Collegiate Board. The college was awarded permanent affiliation by the University of Mumbai within a record span of two years. Over the years K.C. has established itself as one of the leading colleges in Mumbai. This fact is well supported by excellent results, both at HSC as well as at the University examinations and the number of laurels won by the students.